Judge Halts Deportation Of Detained New York Pizza Delivery Man Judge Alison J. Nathan has stopped the deportation of Ecuadorean immigrant Pablo Villavicencio Calderon until at least July 20. He was detained on June 1 while delivering food to a Brooklyn Army base. In this undated family photo provided by Sandra Chica, Pablo Villavicencio poses with his two daughters, Luciana, left, and Antonia. The 35-year-old was detained on June 1 while delivering food to the U.S. Army Garrison Fort Hamilton in Brooklyn. 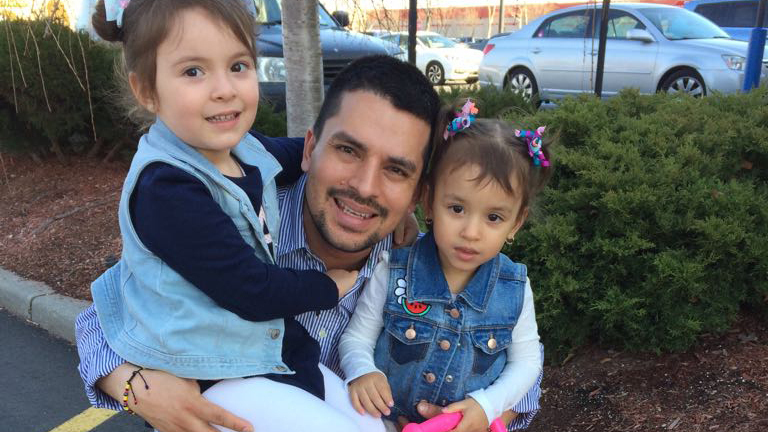 He's being held by Immigration and Customs Enforcement at a facility in New Jersey. "Although we are disappointed that Pablo will remain detained, today's stay is a victory for him and his family, and also for due process and the fair administration of justice," one of his lawyers, Gregory Copeland of the Legal Aid Society's Immigration Law Unit said, according to the group's Twitter account. Fort Hamilton's public affairs office said security officers called ICE after discovering an active ICE warrant for Villavicencio in a routine background check. ICE says Villavicencio was ordered by a judge to leave the country in 2010 but stayed. Villavicencio's wife Sandra Chica said at a news conference last week that she is a U.S. citizen and that both of the couple's children were born in the U.S. She said Villavicencio applied for a green card in February. Judge Nathan's order says the government must keep Villavicencio within the New York City area. "Why was this time any different from any other times Pablo came to deliver food to the Army base?" Brannan asked, according to NPR's Joel Rose. "Why was Pablo singled out?" Prominent Democrats have spoken out against Villavicencio's detention, including New York's governor, Andrew Cuomo. "There's compelling evidence that Pablo Villavicencio was improperly detained," Cuomo wrote on Twitter Saturday. "He should be immediately released from ICE custody and an investigation should be launched into the circumstances of his arrest." New York Sen. Kirsten Gillibrand called the incident "shameful," and said the Trump administration's immigration policies are "inhumane, plain and simple" and do "not make our country safer."